You might know Andrea Morrell by the nickname Pasta Wench. Or perhaps you’ve seen her flavored noodles, raviolis, and sauces on grocery shelves. But her entry into the artisan food scene began with a lesson in farming: Crops need time to grow. About three years ago, Andrea and her husband, GaWaNi “Pony Boy” Morrell, moved to a five-acre farm in Deep Gap and set out to become farmers. She signed up for the Watauga County Farmer’s Market, “but it never occurred to me that you had to wait until your vegetables grow,” she says with a laugh. With no produce, the first-generation Italian-American fell back on the pastas she made growing up with her mother and Sicilian father. She whipped up 50 ravioli with locally sourced fillings and sold out in 20 minutes. It was a telling start for a pasta business that now produces 50,000 to 70,000 ravioli a week. Morrell’s pierogies, fettuccine, tagliatelle, and vegan pastas come in inspired flavor combos—portobello-Asiago-Vidalia, sweet potato-Gorgonzola, and butternut squash with caramelized pear and garlic. Word of her pastas spread through what she calls a “trickle up” marketing strategy. “I started schlepping my stuff to every shop, market, and restaurant within hundreds of miles,” she says. 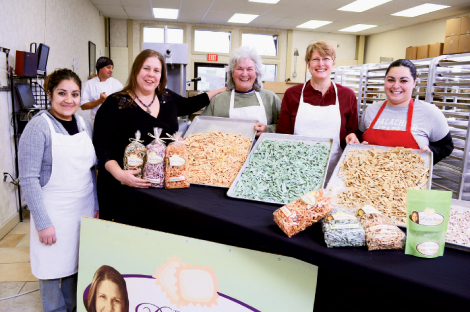 “It was an incredible amount of work—face-to-face, one bag of pasta at a time.” Her employees, “wenchlets” as she lovingly calls them, fanned out to farmer’s markets all over the state. Eventually, a commercial kitchen and 15 freezer chests gobbled up her house. Eight months ago, Morrell moved the business into a 3,000-square-foot production facility in Boone, and by next summer, she expects to expand into an adjoining space. In the meantime, the couple’s organic farm has flourished, providing basil, garlic, spinach, and nearly 20 other herbs, spices, and vegetables that flavor many of her pastas and sauces. “True gourmet foods always use fresh, local, and seasonal ingredients,” she says, indicating the key to her success. It just goes to show that fortunate mistakes can lead to happy endings.